Fifth Wheels and Fifth Wheel RVs – Is a 5th Wheel Right for You? The fifth wheel is the “king” of the towable RV world. Step into an upper-end fifth wheel, and you’ll think you’ve walked into a luxury condo. The interiors are beautiful, well-designed, and comfortable. You’ll also be surprised at the amount of space available. Thanks to the space above the gooseneck hitch, fifth wheels have the most usable space of all RVs, even more than travel trailers. Usually this space is used for the master bedroom, possibly with a master bath as well. Fifth wheels can be monsters – up to 40 feet long (which need a one-ton or even bigger hauler). With slide-outs extended, one of these coaches provides lots of room even for fulltime RVers. What’s Special About a Fifth Wheel? Although they’re classified separately, fifth wheels are really just a specific kind of travel trailer. As such, they have the same advantages: popularity, lots of models to choose from, and lots of room inside. 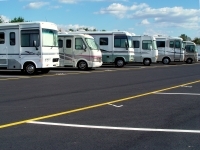 The only specific difference between a 5th wheel and a travel trailer is the connection to the tow vehicle. This difference has lots of implications, though. A travel trailer hitches onto the tow vehicle with a standard trailer hitch. A fifth wheel uses a gooseneck connector instead, which has a kingpin that locks into the receiving hitch. This requires the tow vehicle to have the receiver mounted in its cargo bed. On the one hand, this means you can’t use the cargo bed while you’re towing the RV. On the other hand, it also distributes the weight of the fifth wheel directly onto the tow vehicle, instead of behind the vehicle’s wheelbase as is the case for travel trailers. It also means that fifth wheels are easier to maneuver. They ride smoother, and are easier to back up or angle into parking spaces. Again, this is a result of the hitch being mounted over the rear axle. The hitch is closer to the turning wheels of the tow vehicle, which makes turning easier than the rear-mounted connection on travel trailers. Plus, with a snug connection into the tow vehicle, they can sway less than a travel trailer. And their larger size means fifth wheels can have more storage and larger holding tanks, making traveling more convenient. Small wonder then that fifth wheels are the favorite of many RVers, especially fulltimers. Lower-end fifth wheels can be bought fairly inexpensively – $15,000 and up. Prices go up from there, all the way to $150,000 or more. The problem with fifth wheels is that the upper-end ones are so luxurious. Once you go into one, it’s hard to restrain yourself from wanting it… whether or not you can afford it. The good news is that the profit margins on fifth wheels are significant. If you know what you’re doing, you can save tens of thousands of dollars on a fifth wheel RV. The secret is understanding how the RV industry works. Unfortunately, RV salesmen take advantage of RV buyers every single day. It’s all too easy to be overwhelmed with the beauty and luxury of a brand-new fifth wheel, and overpay by thousands or even tens of thousands of dollars. Fortunately, it’s not too hard to get a great deal on a new fifth wheel. You just have to do a little homework!